Nashville-natives and pop duo Megan and Liz have won over online fans with their catchy covers of pop songs, like their most recent version of Gym Class Heroes’ Stereo Hearts. Now, these 18-year-old twin sisters are ready to burst into the mainstream. Find out more in their Kidzworld Q&A! Megan and Liz's new song is called Are You Happy Now? KW: What made you (both) interested in music? 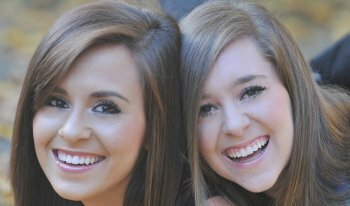 Megan and Liz: Our Mom is a singer! She always would sing around the house when we were little (and still even to this day!) and she taught us that music is fun, and always encouraged us to sing whenever we wanted! KW: Your covers on YouTube are very popular, were you surprised when you started gaining an online fan base? Megan and Liz: We were very surprised! We never thought that we would have as many people as we do following us now, we are extremely thankful to each and every person who does so. We just did the YouTube thing for fun, and then it was amazing, and very surprising to us that there were other people who actually cared about us and what we liked to do. KW: Do you write songs together? Megan and Liz: We do! Writing together is always so fun, and we learn something new with every song that we write. KW: Who are some artists you look up to? 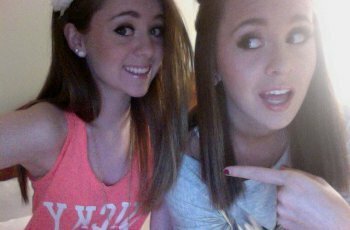 Megan and Liz: We love Taylor Swift, of course, she is an amazing songwriter, and very inspirational. We also really look up to Aly & Aj because they are sisters who write their own music, and that is actually what really got us writing in the first place. KW: You recently appeared at the Teen Vogue Young Hollywood Party, what was that experience like? Megan and Liz: Teen Vogue was AMAZING! Liz: I got to meet my celeb crush (Josh Hutcherson) and I was trying not to freak out the entire time! Megan: I think the red carpet was such an amazing thing to experience, and I we both want to say a big thank you to Shenae Grimes who got us on the list for that party, and for walking the carpet with us. We really owe that whole night to her! KW: Your cover of Gym Class Heroes Stereo Hearts is becoming a big hit online, what made you want to do that song? Megan and Liz: Stereo Hearts was a risky song for us, it was one that we wouldn't normally do, and I think that is why we did it! We always love a challenge when it comes to covers, and the Travie McCoy rap parts... a for sure challenge! KW: Shenae Grimes directed your next video “Are They Happy Now”, what is the song about and what was it like filming with her? Megan and Liz: The song "Are You Happy Now?" is all about anti-bullying. It is basically telling all the bullies out there that it is not okay, and it is meant to show the effect that bullying has on so many young people today. Megan: Filming with Shenae will I think be forever one of my favorite memories and experiences, she is so talented, and one of the coolest most inspiring people I know. Liz: Shenae is really gifted at getting the message of the song across, not only in her vision for the video, but how she worked with us. She went above and beyond what Megan & I could have ever dreamed for this video, and she is also like the big sister we never had! KW: What is the best thing a fan has said to you so far? Megan and Liz: It is hard to narrow it down, because honestly every fan has a unique story, as to why they listen to us, or why they relate to our music. I think that when fans say they can relate is the best thing that us as musicians appreciate. KW: As twins who also perform together, would you say your personalities are similar or not? Megan: I think that I am more guarded when I meet new people, I have a wall that you have to break down a little, to get to the crazy, wild me inside! Liz: I think I find myself really open, I like to just talk and talk and talk, (maybe a little too much ;) ) and I like to really get personal with people right away. I think we have a nice balance between us though, and I think that is what makes us work hard! KW: What are your plans for Halloween? Will you be dressing up this year? Liz: Well, we just moved to a neighborhood full of kids! So we are going to sit and hang out candy! (And sneak a few pieces in between trick or treaters.) As for my costume, I think I am going to be Lady Gaga! I got this awesome blue wig, and now all I have to do is find a crazy fabulous outfit! Megan: I am going to get the scariest mask I can find and just be that! Every other year I have been something cute, like a princess, and last year I was Katy Perry, but this year I am going to be the scary kid on the block! Check out Megan and Liz's new video for "Are You Happy Now?" Do You Like Megan and Liz's new song? Let us know in the Comments Section below! Yeah, I have an identical twin. Yes, I have a fraternal twin. No. I'm an only child. No, but I have siblings.